In 1795, John Winn Smith focused his vision on a portion of his large landholdings where the village of Orlean was emerging. There he built a 1-1⁄2-story log structure as his residence. In the early 19th century, this original log section was joined by a two-story, Federal-style stone addition as well as a frame two-story connecting the stone structure to the original, rear, log section. Today the clapboard and stone landmark is heralded simply as Orlean House. The Entry Hall stretches 19 feet with wide plank pine floors and connects front and rear doors, with access to the dining room, living room and staircase. The Living Room greets guests with a gas fireplace flanked by arched inset bookcases, mahogany paneling, and warm pine floors. Original mural wall coverings provide historical context to the 400 square foot Dining Room. The heart of this house is the Kitchen boasting a massive island under a sunny skylight. Custom cabinetry made from antique wood imported from England is complimented by commercial grade appliances including two large sinks, two dishwashers, and an oversized gas range with pot filler. A sunny Breakfast Room off the Kitchen opens to a terrace as well as a Family Room large enough to welcome a crowd yet perfectly imitate for cozy gatherings. The Master Bedroom serves up quiet and peace with pine floors, gas fireplace, two closets and comfortable seating areas. The updated master bath is across the hall. 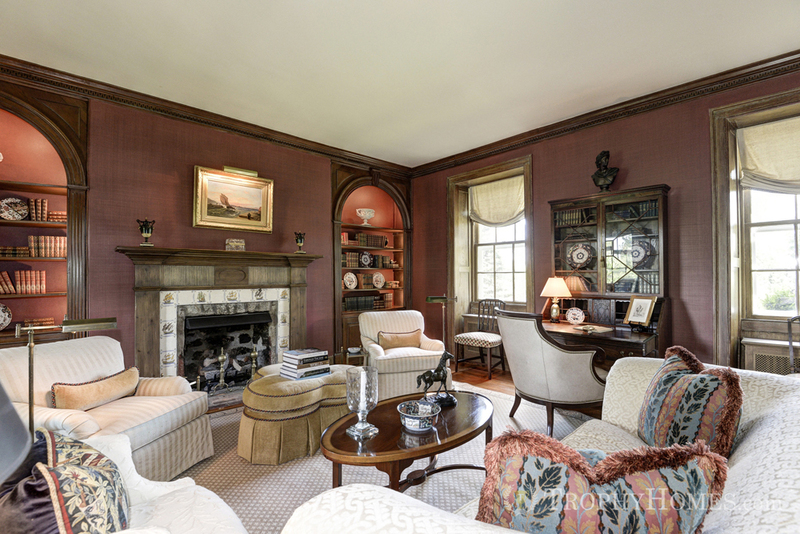 Two more bedrooms — the Green Room and Yellow offer spacious quarters with fireplaces and adjoining bathrooms. The third floor Eaves Bedroom offers skylights, exposed beams and pine flooring. The Study presents an alcove for work or reading. On the lower level, there is a large exercise room that could easily repurpose as a game room or expansive wine tasting room. This large room features gas fireplace, stone walls, and pine floors. The Guest Cottage is a cozy two bedroom, one bath house nestled in a private garden with an inviting front. Its charms include a living room/dining room with cathedral ceiling and a wood burning fireplace, two bedrooms connected by a full bath with shower and a separate kitchen. The 18 acres of immaculate grounds have most recently been featured in the Spring 2014 issue of Home & Design. A new landscaping design was completed by Richard Arentz, one of the country’s leading landscape architects. The property is a secluded retreat with wonderful views of the Blue Ridge Mountains from the lush gardens and lawns surrounding the houses to the tennis court and paddocks above. An airy Guest Cottage welcomes family and friends under a vaulted beamed ceiling with two bedrooms, kitchen, bath and warm hardwood floors throughout. Stables and Riding Ring: A traditional barn layout features 5 large box stalls (12×12), a wash stall, and a drive through brick center aisle. 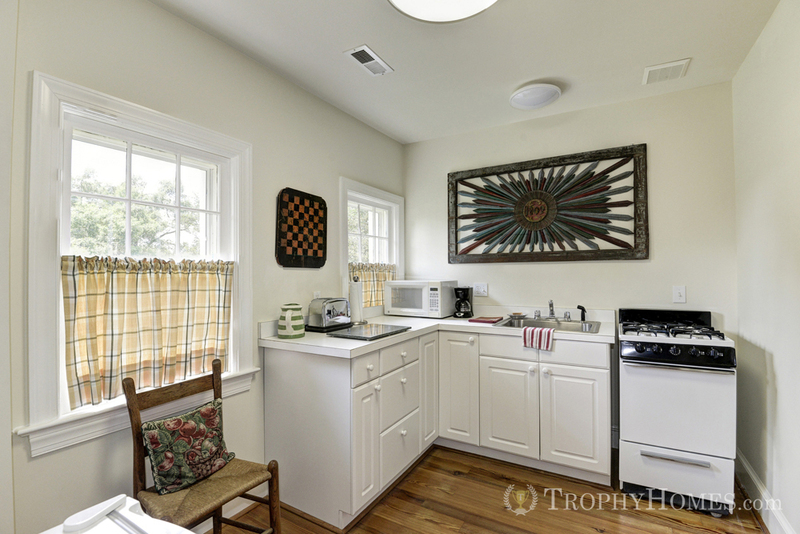 The large tack room/office includes a washer/dryer and ample seating and work space. There is also a hay loft and additional storage. Pergola/Reviewing Stand: Covered in wisteria, it's a lovely stand for viewing tennis and a stunning dining location with its outstanding mountain views. At the center of the village of its namesake, Orlean House is ideally situated for participation in the local hunt, Old Dominion Hounds. The village boasts the Orlean Market and Restaurant, just across the street adding a wonderful community connection with handmade pastries and ice cream, deli counter, great sandwiches, artisanal snacks and delicious carry out food and table service. The nearby village of Flint Hill boasts The Griffin Tavern and the Public House Inn and restaurant. Nearby Warrenton is the home of the Bridge Cafe, Claire’s at the Depot, and lots of shops, groceries and services. Nearby are excellent theater, concerts, art galleries, wineries, and the Shenandoah National Park. Equestrian pursuits (fox-hunting, trail riding, dressage) are very popular local passions. A half-hour away, The Upperville Colt & Horse Show is the oldest horse show in America. The Show spans seven days and showcases over two thousand horse and rider combinations. Orlean is 11 miles from Rt. 66 (Marshall exit 27). Approximately 64 miles from Washington, DC. Travel time to downtown DC is 1 Hour 15 minutes (in low traffic situations). Approximately 45-60 minutes to Dulles International Airport. 1 hour 15 minutes to Charlottesville. 10 minutes to Warrenton.